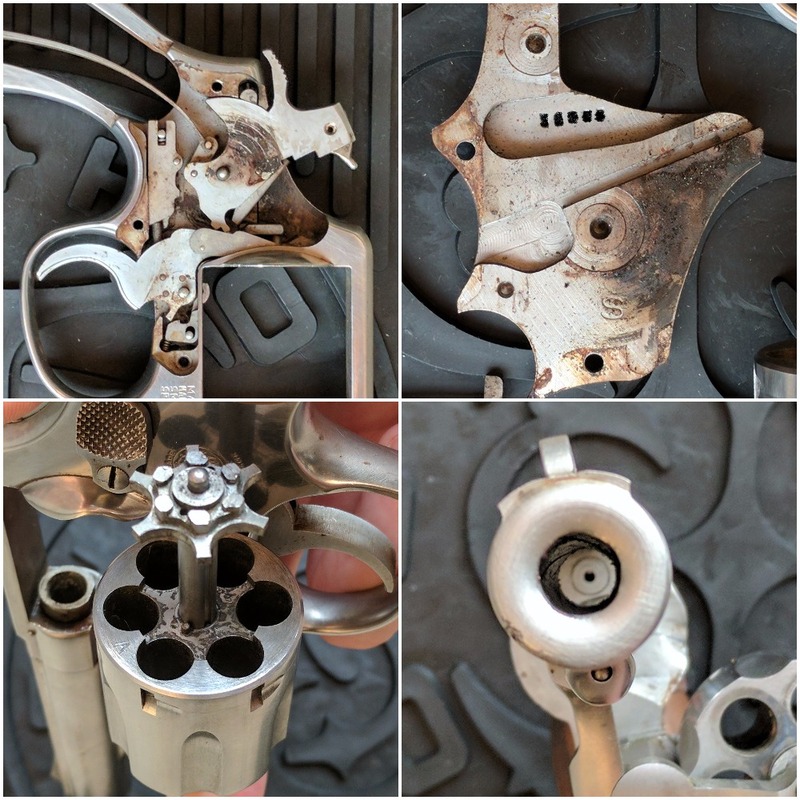 On a recent visit to my significant other's hometown, her grandmother, affectionately known as Nana, requested to clean up an old revolver. 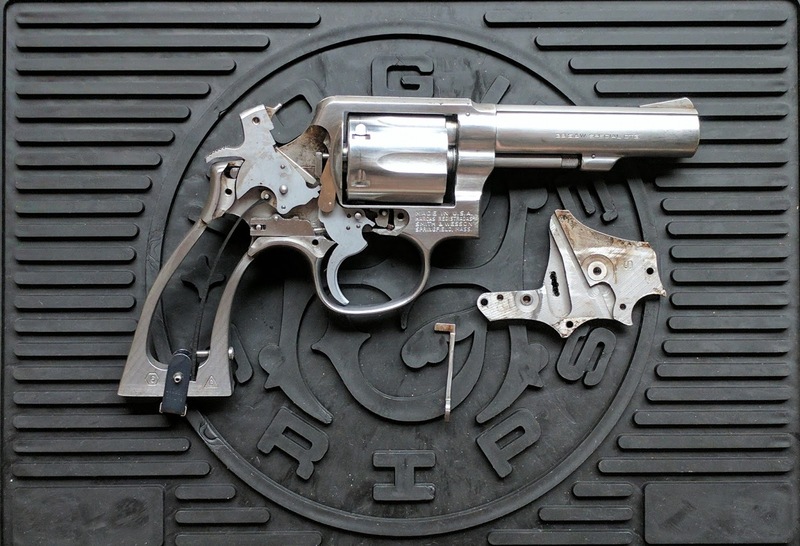 This old Smith & Wesson was the only surviving firearm following a house fire. 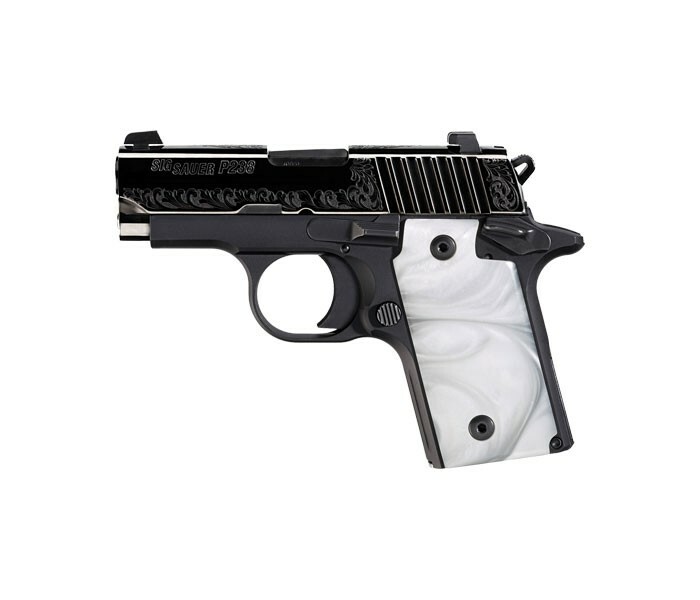 Nana is a Southern Belle who visits the range frequently to practice with her current carry gun, a Sig P238 (pictured above). In my opinion, this woman is a saint for all she has done for BK so I was happy to work on this weathered old piece. A bit rough on the inside, but it could be worse. I think it is important to note that the fire was nearly two decades ago, so all the springs needed to be changed. 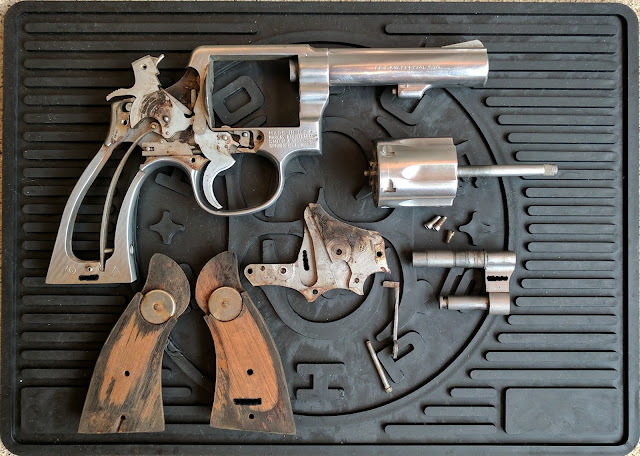 I wanted a lighter trigger pull while maintaining ignition on several factory primers in case Nana ever wanted to shoot it. I installed a new factory mainspring and a Wolff 14 pound trigger rebound spring. Turning the mainspring strain screw all the way in still resulted in a heavy pull, so I backed it out a bit before applying a bit of thread locker to ensure the screw stays put. I did not fire Nana's Model 64. I honestly expect it to go back in a drawer, never to see a range, and I'm totally ok with that. 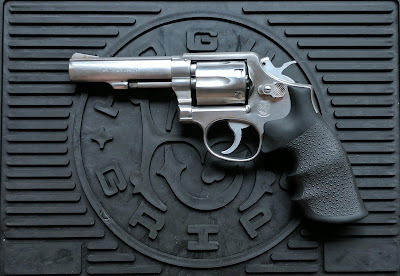 If she wants a wheel gun, a modern Smith & Wesson with more visible sights will be a better choice for her to learn revolver shooting. While I may not have tested that particular gun, I have shot both a S&W Model 64 and a S&W Model 10 at an indoor range. 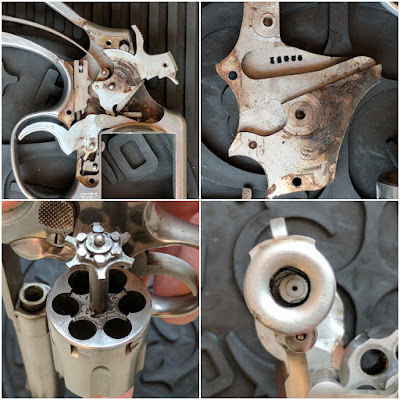 A four inch steel K frame is about as balanced a revolver as you can find. Recoil with .38 Specials is comfortable and +P rounds are manageable. The negative aspect of this design are the minimal sights. A slender ramp front sight paired with trench style rear sights are difficult to see. A bit of brightly colored paint on the front ramp helps, but not all rounds that hit point of aim/point of impact with this configuration. I'll take a S&W with an adjustable rear sight any day, but you could do worse than a fixed sight model. I really enjoyed cleaning up this old revolver for Nana. These workhorses shoot fine even if the sights leave something to be desired. For the average shooter, this revolver is more than enough for target practice, competition, and/or personal defense. The Smith & Wesson Model 64 was produced in large quantities and many law enforcement agencies issued these in droves. Why does that matter? Well, every so often a department will liquidate old inventory and these used revolvers regularly appear in online stores, often at a discount. If you see one in decent shape for a bargain price, definitely add it to your collection.